There’s a place in the Netherlands where fairy tales come to life. Literally. You can see the wolf knocking on the door of the house of the seven young goats or the red shoes of Karen that never stop dancing. The Efteling theme park (De Efteling in Dutch) is not just a regular theme or amusement park. It is a place where you get transported into the magical world of fairy tales minus the commercialization and into-your-face attractions. Unleash your inner child in this enchanting world, as the Efteling is not only for kids but also for grown-ups who need a bit of magic and the occasional thrill in their everyday lives. Buy your tickets for Efteling here! DISCLOSURE: This site contains affiliate links. If you make a purchase via one of those links, I will earn a commission at no extra cost for you. This is not a sponsored post. Each time I have visited Efteling, I have paid everything myself. The Efteling will always be one of my favourite places in the Netherlands and I know, I’m lucky to live only 10 km away from the park and be able to visit it oftener than the rest. Here, where I live, people grow up with the Efteling being their backyard playground, and I am a kind of jealous about it. Most Dutch kids living in the area, get a whole year abonnement for the park from their parents. Thus, after school when biking back home they can pop by in the park and enjoy a ride or two, or just hang around. 1 What makes Efteling so unique and unusual? 3 How to get to Efteling? 4 When is the best time to visit Efteling? 10 Where to stay near Efteling? What makes Efteling so unique and unusual? There’s a story behind each attraction – a fairy tale or a local legend that is told with a passion and all details are mastered to perfection to give you the illusion that you are a part of the story. The waiting areas for the coasters (Baron 1898, the Flying Dutchman or George and the Dragon) for example, aren’t just simple spaces where you are standing in queue. They tell you the story in such an immersive way that you become part of it – you go on a quest to explore far lands or to work in the mines. The Fairytale Forest is not only for kids, although kids are having most fun running around and hugging the giant mushrooms that are radiating gentle music. The Fairytale Forest takes you on a journey where well-known and less known, but locally popular, fairy tales come to life. There’s a talking tree telling stories, you can spot the house of Hansel and Gretel, the Sleeping Beauty and Cinderella aren’t missing as well, and the Little Match Girl always gets a tear in my eye. This Dutch theme park is not your regular amusement park where less or no attention is paid to landscaping. Located amidst a forest, the Efteling is a real park with beautiful gardens and a lot of green. On the grounds of a former sports and recreational park created in 1933, the first 10 fairy tales and the Fairytale Forest open in 1952. Efteling was born from the love and the crazy idea of three great men: Mr. van der Heijden (mayor of Loon op Zand), his brother-in-law Mr. Reijnders (film-maker) and the artist illustrator Anton Pieck. I recently saw a documentary made for the 50th anniversary of the park, where the already grown-up children of the mayor and the film-maker were telling how actually the Efteling began. You can feel how much love and imagination went into the making of it. They were using simple techniques to animate the fairy world around them, without any robotics or high-end technology, yet with great success, as the kids believed everything they saw was real. Thus, we learn that the heaving bosom of the Sleeping Beauty was actually made from a bike tyre and that Snow White used to stay at the cupboard in the house of the Reijnders family and the kids were playing with it before it was installed in the park. Unfortunately, this documentary is only in Dutch. The visual concept of the Efteling is done by the Dutch artist Anton Pieck, who worked for the park between 1952 and 1974. In the years after, his successors followed his concept and designs and this is why today the theme park is so coherent in its visual appeal. The nostalgic drawings and fairytale world of Anton Pieck come to life in the Efteling. How to get to Efteling? Located centrally in the Dutch province of North Brabant, Efteling is easy to reach by public transport. Basically, you will need to get either to the train station in Den Bosch (‘s-Hertogenbosch) or to the one in Tilburg and get the bus respectively to Tilburg or Den Bosch. Bus lines 300, 301 and 136 that run between these two cities stop at the Efteling. Line 136 is slower than the other 2 options. If you are travelling by public transport, check the possibilities by clicking on this button. If you are travelling from Amsterdam or Brussels to the Efteling, you might use Flixbus as well, just search for Kaatsheuvel (De Efteling). The park is also easy to reach by car, although during school holidays or sunny weekends there tend to be slight traffic jams in the morning when the park opens and in the evening. If you arrive by car, you should consider that you will need to pay extra 10 EUR for parking. When is the best time to visit Efteling? The Efteling is open all year round and each season is equally magical in the park, however at the weekend and in the summer or during school holidays it gets busy in the park. The Efteling is the dream day trip for all Dutch kids so you can imagine that during school holidays there will be more people than on a regular day. There’s a handy calendar on the website of the park, where they show if they expect it to be a busy day. So, my advice is to visit the Efteling during week days outside of the school holidays. Winter Efteling is a real winter Wonderland. As if the whole park puts his winter clothes on – all attractions get special winter decoration. There’s artificial snow and you can warm up your hands at the bonfires at each square. There’s this cheery wintery atmosphere everywhere. Although some of the rides aren’t open in winter (like the Piraña or the Flying Dutchman), there is a huge skating rink at the Ice Palace, as well as daily entertainment shows. Buy your tickets for Winter Efteling here! I love how they perfection details at the Efteling. For example, all street lights get icicles hanging from them, the young goats from the The Wolf and the Seven Young Goats get winter pullovers and wrapped in shawls and there are tiny skis propped outside on the house, the bird in the front of the Bird Rok dark ride gets a shawl and a Santa hat. And when it does snow on those rare occasions in the Netherlands, there isn’t a place more magical than the Efteling. Then you can see how real and subtle the winter decoration actually is – nothing over the top, as it naturally blends with the snow. The most magical New Year’s Eve I have ever spent was at the Efteling. With the bonfires lighting the squares at night and the smell of mulled wine and oliebollen, the Efteling turns into a fairy tale came alive. On New Year’s Eve the park is open till 1 am and you can visit all attractions that are open in winter. There’s live entertainment and some of the attractions get a special 3D mapping show projected on them. At midnight the most enchanting of all fireworks will lead you into the New Year promising plenty of magical moments in your life ahead. Click below to go directly to the website of the park. A typical Dutch tradition for New Year’s Eve is the oliebol – a deep-fried kind of doughnut (without a hole) with icing, which has to be eaten warm. A special kind of oliebol are those with raisins. I can’t remember a New Year’s Eve in the Netherlands without oliebollen, so don’t forget to try them at the Efteling at the New Year’s Eve. In the summer (July and August) the park is open till 8 pm and on Friday and Saturday till 11 pm when the Summer Festival (Negen Pleinen Festijn) is celebrated. During the Summer Festival there are many special events, live entertainment, street theatre performances and a food street with Dutch summer delicacies. Baron 1898 – a dive coaster where you fall into a mine shaft from 37,50 m with 90 km/h speed. George and the Dragon (Joris en de Draak) – a double-track wooden racer roller coaster that cracks and rattles when you dash along with 75 km/h. Symbolica – a trackless dark family ride where you visit the king’s palace and at the end you are spinning and dancing around at a grand ball. Dream Flight (Droomvlucht) – a suspended dark ride where you ‘fly’ through a magical kingdom of elves, trolls and unicorns. The Flying Dutchman (De Vliegende Hollander) – a dark ride and water coaster in one themed around the legendary ghost ship that is doomed to sail till the eternity. Piraña – a river rapids ride that’s great to take on a hot summer day. Python – a double-loop corkscrew roller coaster. This one is for the daredevils, but so fun. The original Python built in 1981 was demolished in the beginning of 2018 and substituted by a replica a few months later. Steam Carousel (Stoomcarrousel) – a vintage indoor carousel from 1895 for the nostalgia lovers. Fata Morgana – a dark tow-boat ride that will take you on a journey into the 1001 Arabian Nights world. Bird Rok (Vogel Rok) – an enclosed roller coaster where you meet the legendary bird Roc and Sinbad the Sailor. Villa Volta – a madhouse that will play with your senses and perhaps will succeed in turning you upside down. One of my favourite attraction in the park. It’s based on a local legend in Brabant about the buckriders and their leader Hugo van den Loonsche Duynen. Half Moon (Halve Maen) – a ship swing that is made after the famous Halve Maen ship of the Dutch East India Company, not my personal favourite as I get terribly sick on it. Pagode – a 60-m observation tower that has a revolving cabin in the form of a temple. From the Pagode you can see how huge the whole park is. Gondoletta – a tow boat water ride. This is also one of my favorite things in the park – taking a boat ride on the lake, especially beautiful in spring time. Diorama – a miniature village (60 m long) with model trains, mountains and villages. Fairytale Forest (Sprookjesbos) – this is where Efteling actually began and this is Efteling’s most emblematic section. The fairy tales are set amidst trees and beautiful landscaping. Aquanura – an amazing water and fountains show based on the Frog King fairy tale. Visit Efteling on a workday when it’s less crowded. Download the Efteling App where you can see in real time what the waiting time for the various attractions is. They are pretty accurate and you can save a lot of time. Buy your tickets online to save 2 EUR on the price. You can extend your New Year’s Eve package with a dinner at the Efteling, but you need to book enough in advance as tickets tend to sold out quickly. Bring your own lunch if you are visiting the park on budget. Picnicking is allowed at the Efteling. Stay overnight at one of the park’s accommodations to have multi-entry tickets (see below in the section Where to stay near Efteling for more info). Read the fairy tales and the stories behind the attractions in advance on the website of the park, as they are told in Dutch during the performances. There are also boards in English with stories at each attraction. Try poffertjes – typical Dutch miniature pancakes, usually eaten with butter and powder sugar. If you are travelling by public transport, take bus 300 from Tilburg or Den Bosch, as it’s the fastest one. Be prepared that one day won’t be enough to see and do everything at the park. Where to stay near Efteling? Click here to go directly to my complete guide to the hotels near Efteling. As I have already mentioned, one day is pretty much insufficient for Efteling, especially if you want to see everything. Then why hurry and not take a hotel for one or two nights even. If you decide to stay longer at the Efteling, there’s plenty to do in the region. The theme park is bordering with two Nature Parks – the beautiful National Park Dunes of Loon and Drunen and Huis ter Heide. Besides, you can visit one of the big cities located nearby – Den Bosch (‘s-Hertogenbosch), Tilburg or Breda. Another lovely day-trip could be the little walled town Heusden. Whatever you choose: overnight stay, weekend escape or a small holiday, you won’t be disappointed. You can stay either at the Efteling’s own accommodations: Efteling Hotel, Bosrijk or Loonsche Land, or in the nearby villages Kaatsheuvel, Sprang-Capelle, Loon-op-Zand. Read: My complete guide to the hotels near Efteling. It contains recommendations for the best places to stay within a walking distance from the park, as well as some other great suggestions. Want to visit Efteling? Pin this for later! 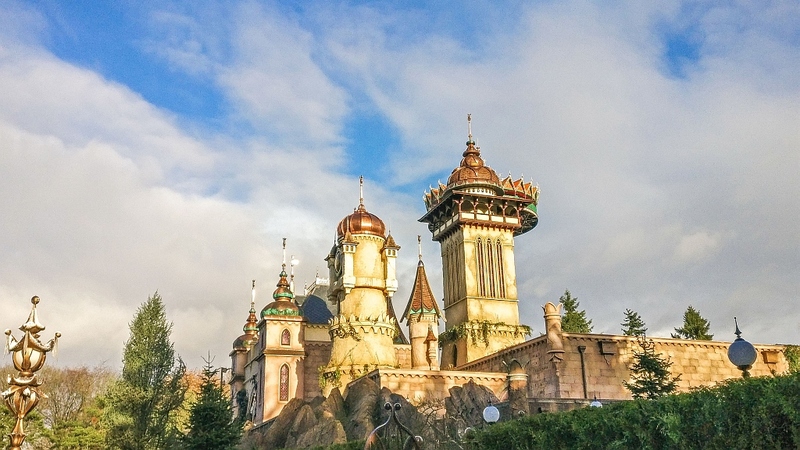 Have you been to the Dutch theme park Efteling? Which is your favourite ride? Are considering visiting Efteling and have questions? Ask them below in the comments and I will help you.